Windows XP OS runs about 40 percent of all business computers. Without the support of Microsoft updates and fixes, your Windows XP computers will no longer be secure to cyber attacks. As of April 8, your computer should function, but it will be at risk of viruses, spyware or malware. This may result in crashes or, even worse, the theft of your personal information. Buy a new laptop/desktop with Windows 7 installed. Stay off of the Internet. If buying, a low end price option is the Chomebook at around $200. If you buy through the Microsoft Store, Microsoft is offering $100 off the price of a new PC running a new version of Windows, if you’ll switch. See more at: eweek.com. Are you ready for the Windows XPocalypse? What are the qualifications or standards for individuals who administer company D.O.T. driving tests? Per Part 391.31, every driver should be road tested, as part of the Driver Qualification (DQ) process and given a Certificate of Driver’s Road Test. If the driver does not have a CDL but is driving a Commercial Motor Vehicle (CMV), he or she must be road tested. Owner-operators or non-CDL owner-drivers (referred to by the DOT as “a driver who is a carrier”) need to be road tested by someone other than themselves. After the successful completion of the road test, a copy of the Certificate of Driver’s Road Test should be placed in the Driver Qualification file, and a copy given to the driver. When can the Road Test be administered? The road test may be conducted before administering the DOT pre-employment drug screen. After receiving results of the drug test and after a job-offer, if required by company policy, a DOT physical can be administered. What should be covered on the Road Test? The attitude of the driver, while driving a commercial vehicle. 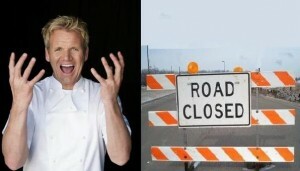 How is a Road Test done? A road test should begin with a full pre-trip or “walk-around” or safety inspection as required by §392.7. The driver should explain what is being looked at during the inspection, for example, any possible safety defects, as he or she observes and checks the vehicle. The driver should demonstrate his or her range skills including steering, stopping, shifting and backing exercises. Coupling and uncoupling of combination units should be included, if the equipment he or she may drive includes combination units. Safety Tip: The driver’s range proficiency (the parking and backing portion) should be adequate enough to determine that the applicant will drive safely during the on-the-road portion of the test. 1. Four left-hand and four right-hand turns. 2. A straight section of road in or near a business district. 3. Three or more intersections with various controls and rights-of-way as stop, yield, a yellow caution light, etc. 5. At least one tight curve. 6. A five mile section of limited access highway or expressway or a stretch of rural two-lane highway.The applicant should demonstrate lane changing during that part of the test. 7. A downgrade long enough to allow the driver to demonstrate downshifting and /or stopping without rolling. 8. An upgrade (hill) to show stopping/starting without rolling backward. 9. An underpass or bridge with a posted weight limit or some other hazard which the driver should see and identify to you when asked. If the above features are not locally available, then it may be possible to simulate that portion of the test. For example, if no railroad-highway grade crossing is near, the road-test administrator can say, “At the sign (or some landmark) ahead, I would like you to simulate a rail crossing.” Document why any portion of a road test was not done. All tests should be conducted in the same manner for all drivers. Click here for a road test evaluation form in .pdf format. 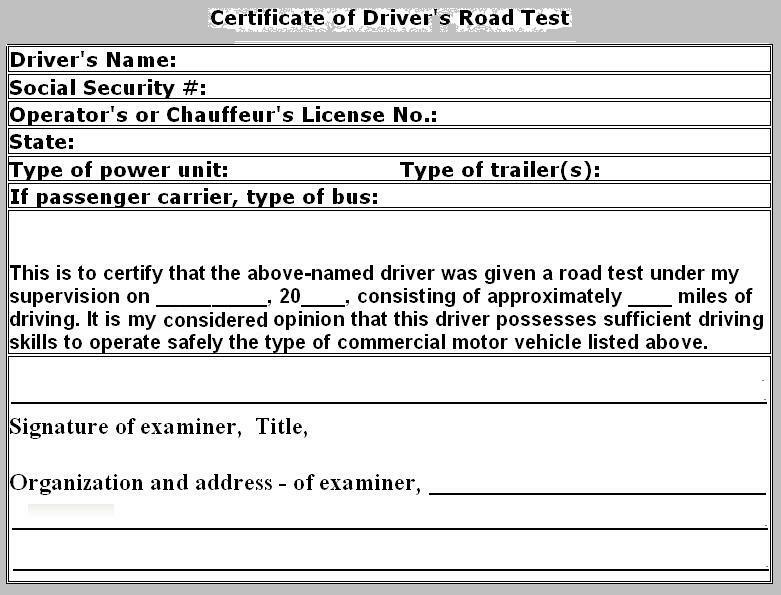 This form is placed in the driver’s DQ file at the end of the test. JJ Keller has commercially printed forms. A copy of the CDL alone is not sufficient for any driver required to have a double/triple trailer or tank vehicle endorsement. These CDL drivers need to be road-tested. While no specific CSA points for a Part 391.31 violation are allocated in Table 3. CSMS Driver Fitness BASIC Violations of the CSA Methodology, keeping inadequate safety records or failing to provide records can result in fines of varying amounts. Road test every driver as part of the qualification process. All non-CDL CMV drivers must be road tested, as well as CDL drivers required to have a double/triple trailer or tank vehicle endorsement. A driver cannot roadtest himself. A competent driver in your organization should conduct the road test. Conduct every road test in the same manner. 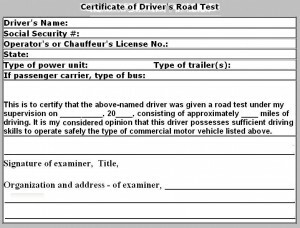 Give the driver a copy of the Certificate of Driver’s Road Test and put a copy in the DQ file along with a copy of the Road Test Evaluation form.